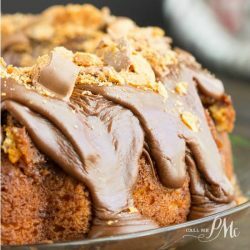 Butterfinger Blondies recipe, these soft and chewy blondies are loaded with white chocolate and rich peanut buttery Butterfingers! 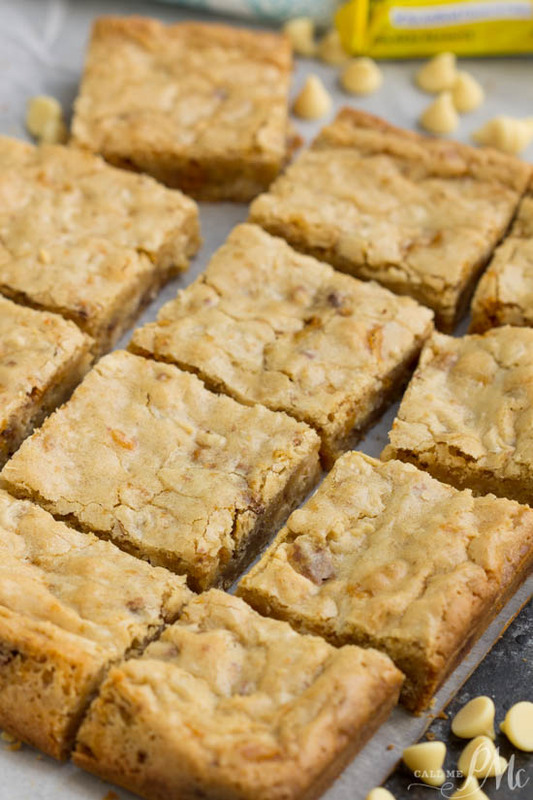 If you’re a Butterfinger fan, you’ll love this blondies bar dessert recipe. 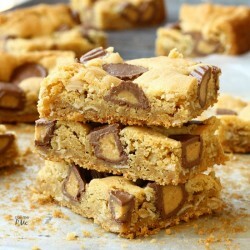 I’m a big believer in packing blondies to the max with chocolate goodness! 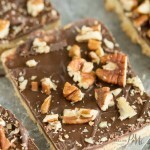 The recipe is perfect for any candy bar substitutions of your liking. With Halloween just around the corner use it as an opportunity to clean out your pantry and use up your half-eaten bags and odds-and-ends of chocolate candy. Instead of eating those fun-sized Butterfinger bars, which is exactly what I could do, I made Butterfinger bars for everyone to enjoy. 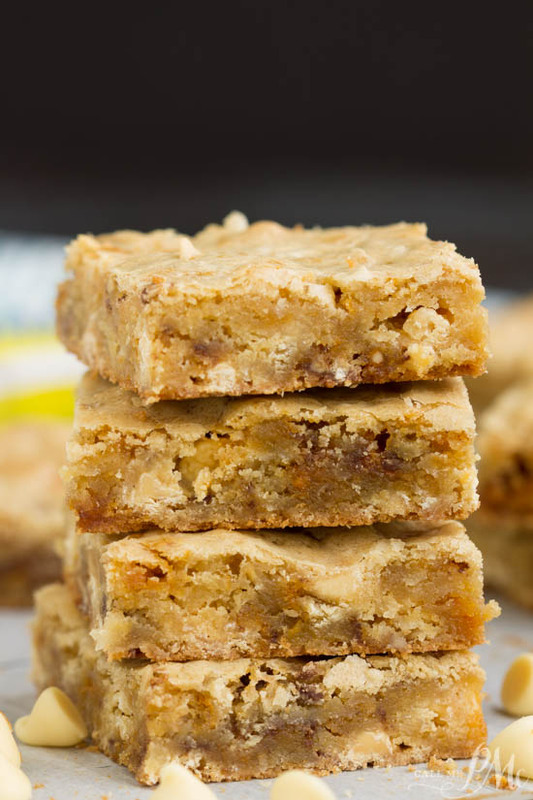 Butterfinger candy bars are the main attraction in this Butterfinger Blondies recipe. These bars are buttery, dense, thick, and full of crunchy AND creamy texture. 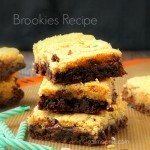 Blondies are similar in texture to brownies but don’t contain cocoa. They have a dense, moist texture like a brownie not a light, fluffy texture like a cake. You’ll need to grease a 9×13 inch cake pan. Additionally, you can line the pan with parchment paper or non-stick aluminum foil. Any candy bar can be used as well as any size. I used four full-sized bars chopped. You may want to use a combination of different bars and/or chocolate chips or nuts. Butterfinger Blondies recipes are dense bars and a texture lover’s dream. 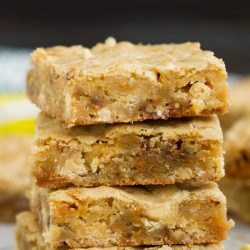 There’s an abundance of crunchy chopped Butterfinger candy bars, contrasted with soft, buttery, moist, and chewy dough. Spray a 9x13 inch cake pan with non-stick spray. With an electric mixer cream sugar and butter together until smooth. Gradually add flour and mix well. Add vanilla. Fold in Butterfinger bars, nuts, and white chocolate by hand until evenly distributed. Spread in prepared pan and bake for 22 to 25 minutes. These are a great dessert option! I have to bake them up asap! I just love me some butterfingers so I know these would be a hit over here! Butterfingers were one of my favorite candy bars growing up! I love these blondies with them! I could eat the whole pan of these! So delicious! These are such an amazing treat! Wow and Wow !!! I LOVE this dessert! Yummy! This made me drool. Cannot wait to try this. This recipe looks incredible! Thank you. 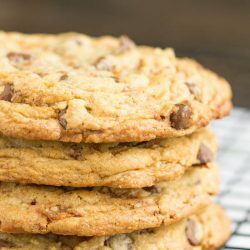 This will be made for my next together, they look so tasty! What a great use for extra Halloween candy!